Chancellor Ronnie Green (at podium) gestures during the July 10 open house at the new University Health Center facility. The 107,000-square-foot facility is the new home to the University Health Center and the Lincoln division of the University of Nebraska Medical Center's nursing program. The 107,000-square-foot complex, located at 550 N. 19th St., along Antelope Parkway near 19th and S streets at the University of Nebraska–Lincoln, opens for business July 16. Half of the new facility houses the University of Nebraska–Lincoln Health Center, while the other half is home to the University of Nebraska Medical Center College of Nursing Lincoln Division. The university celebrated its completion with a grand opening ceremony July 10. 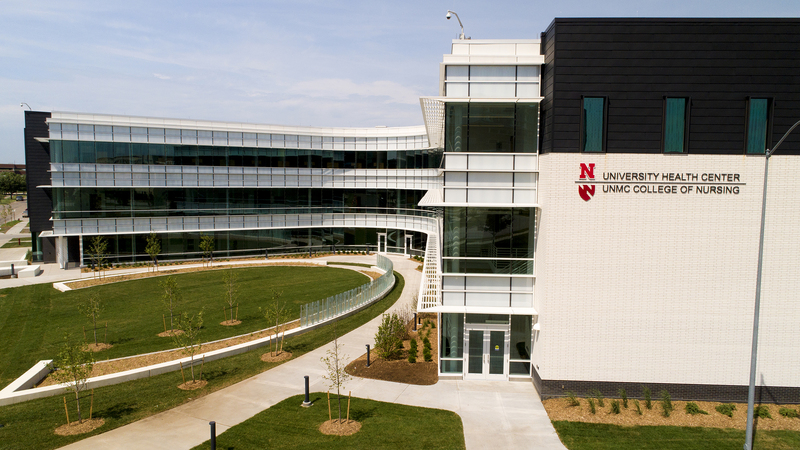 University of Nebraska–Lincoln Chancellor Ronnie Green described the facility as a smart example of collaboration between his institution and UNMC. “By working together to benefit our students and our state, we found a way to better serve the health needs of our students, provide top quality nursing education in Lincoln and meet the state’s need for nurses,” Green said. As approved by the University of Nebraska Board of Regents, the project budget was $43.9 million. The cost of the College of Nursing portion of the building is estimated at $19.8 million, while the University Health Center portion is about $24 million. The College of Nursing portion was paid by state funds and private contributions, while student fees and patient revenues are being used to fund the health center portion. Construction began in November 2016, with Nebraska-based Alley Poyner Macchietto Architecture as lead architect and Hausmann Construction serving as general contractor. Nebraska’s existing student health center at 1500 U St. opened in 1958. The replacement facility will provide students a contemporary, private and easily accessible environment for health care. For example, a full-service pharmacy will be located just inside the Health Center entrance, enhancing privacy and convenience by allowing pharmacy customers to pick up prescriptions without crossing the patient waiting room. An expanded physical therapy department offers a SwimEx hydrotherapy pool and a gymnasium with cushioned sports flooring. 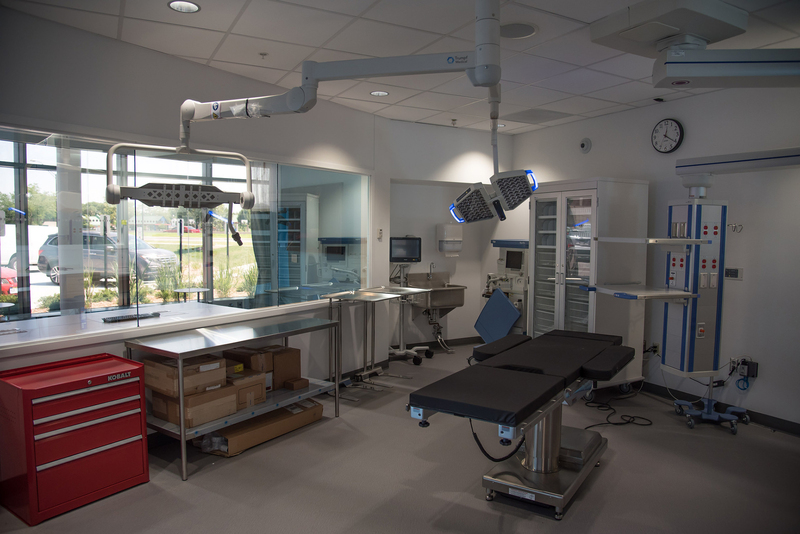 The medical clinic, which is limited to students, offers 26 examination rooms with dedicated space for triage, procedures, casting and other services. Counseling and Psychological Services, previously in multiple locations across campus, has been combined into a single location at the new facility. Other amenities will include a wellness kitchen to promote healthy nutrition; dental, optometry, radiology and laboratory services; and an area dedicated to helping students manage stress and anxiety. The new University Health Center and University of Nebraska Medical Center nursing facility opens for business on July 16. Nebraska Medicine, UNMC’s primary clinical partner, operates the University Health Center and employs its physicians, nurse practitioners and other staff. Since its establishment in 1974, UNMC’s College of Nursing Lincoln Division has had several locations on or near City Campus. It had been based in leased space in downtown Lincoln since 2005. From 1976 to 2005, the college was located in Benton and Fairfield halls on City Campus. Its new site will attract more nursing faculty and raise the level of nursing education and research. With the American Association of Colleges of Nursing predicting a growing shortage of nurses through 2024, the facility will help UNMC meet the state’s need for nurses. Combining the Health Center and the College of Nursing Lincoln Division will allow both institutions to enjoy savings and increase effectiveness in utilities, space and technology. Brian Hastings, president and chief executive officer of the University of Nebraska Foundation, said the university is grateful for the people and organizations who contributed to the new complex. “They clearly understood the need for this new, student-centered complex and were motivated because of the long-term opportunities it provides both academically and for students’ access to quality health care,” he said. A teaching space inside the University Health Center/UNMC nursing facility. • UNMC College of Nursing alumna Barbara Sand of Lincoln, in memory of her uncle, the late Dr. Harold Daum, a UNMC alumnus. The Health Center will be closed from 5 p.m. July 11 to 8 a.m. July 16 while staff moves into the new building.